Dr. Alex Chan moved to Washington from Hong Kong at eight years of age. He completed his undergraduate degree in Business Administration at the University of Washington in 1994. It is also there that he met his wife Tracy. Now they have two daughters Annika and Celine. 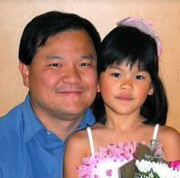 Dr. Alex Chan received his Doctorate in Dental Surgery in 1998 from the University of Washington. Dr. Alex Chan firmly believes in the motto treat and respect others the way you want to be treated and respected. “I love the relationships I have formed with patients, both new and ones cultivated over years of personalized care.” Dr. Chan loves the creative and artistic aspect of dentistry. Therefore he enjoys advanced training yearly through continue education. He is also a member of the American Dental Association, Washington State Dental Association, Academy of General Dentistry, and the Pankey Association. Dr. Chan loves to spend time with his family but also enjoys the challenges of growing and developing an ecosystem for coral and salt water fishes in his reef tank.